People do NOT have to be a member of our in-world group or community website to roleplay with us; however, we ask that players please take a tour of the Visitor Center in NeoVictoria SIM to learn about the storyworld before joining in the roleplay. If you wish to become a member of our community website, request an invitation by completing the application: we usually respond within 24-hours, though it can be longer on the weekends. Roleplay in NeoVictoria uses the Steampunk aesthetic and is free-form, with most preferring turn-based, para-roleplay. Further discussion of NeoVictoria presumes you have a basic working knowledge of these ideas. NeoVictoria has its own history and backstory, its canon is unrelated to the other Second Life SIMs. We do NOT cross storylines here. If you roleplay in other SIMs, please do not bring active storylines from those places here. NeoVictoria’s rules are subject to revision at any time. Every effort will be made to incorporate changes or additions to the rules immediately, however, Game Masters (GMs) reserve the right to enforce any and all NeoVictoria rules regardless of their inclusion herein. A GM’s ruling is final and will not be over-ruled by other GMs. 1) Movies get made here and you may be recorded. NeoVictoria is a privately-owned estate which Admin-approved machinima-makers use to make movies. By playing in the NeoVictoria SIMs you are agreeing your avatar may be recorded as part of one of these productions, and you assign the rights to the video recording(s) and photograph(s) made of your avatar to the recordist/cinematographer/photographer. By entering this simulation, you also authorize the editing, re-recording, duplication, reproduction, copyright, sale, exhibition, broadcast and/or distribution of said recording(s) and photograph(s). The covenant does NOT allow machinima UNLESS you have Asil Ares written approval. If you are a machinima artist and want to shoot in NeoVictoria you MUST speak with ASIL ARES first. The covenant for this land DOES allow for the taking of snapshots. Taking snapshots does NOT require Asil Ares written approval. 3) You must be an adult to play in NeoVictoria. DUE TO CHANGES IN THE SECOND LIFE TERMS OF SERVICE, BY ENTERING NEOVICTORIA YOU INHERENTLY AGREE TO ABIDE BY THESE RULES, YOU AGREE THAT YOU ARE OVER THE AGE OF EIGHTEEN IN REAL LIFE AND YOU ARE NOT OFFENDED BY VIOLENCE, ADULT LANGUAGE OR SEXUAL CONTENT. THE OWNER OF NEOVICTORIA DEFERS ALL RESPONSIBILITY BEYOND THIS AGREEMENT, IN LEGAL LIABILITIES, TO THE TRESPASSING PARTY, PARTIES NOT OVER THE AGE OF EIGHTEEN YEARS IN REAL LIFE ARE TRESPASSING AND THUS LEGALLY LIABLE FOR THEIR OWN ACTIONS. 4) No combat allowed that uses scripted objects. We have a free roleplay HUD called the “NeoVictoria Roleplay Tool” which includes a simple dice roll; use this when you need to randomize combative roleplay. This is a Steampunk world, when you enter the in-character game-grid (i.e., the land level of the simulations) you’ve entered an alternate reality of Pax Britannica (think the Victorian era, but with less stuffiness and more creatures). We may have marvelous machines and magic. We might even have nifty energy weapons and automatic firearms. But what we don’t have are ripped jeans and booty shorts. 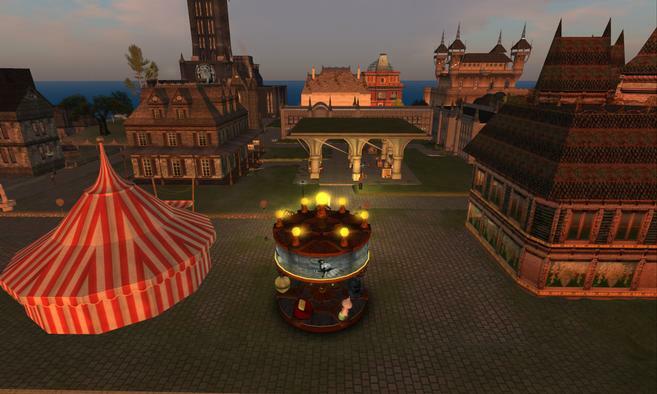 Dress in the spirit of the place (Victorian, Steampunk, high Goth) or play elsewhere. NeoVictoria is a no-fly zone. Do not use flight enablers in the SIMs. This includes workarounds to access Second Life’s “Fly” function as well as scripted attachments and vehicles that allow flight through other means. Unless you are mer-folk or undead or water-loving supernatural or werebeast, please use bridges, barges or a swim HUD to cross the NeoThames. Unless you are undead, walking underwater during roleplay won’t work. An avatar unburdened by heavy clothing and weapons, using swim animations may swim if they choose, but then must roleplay the consequences of getting wet. A wet sword will work fine, but most guns will not. Violators will be disciplined at the discretion of the GMs. 9) Chat logs are used. By playing in the NeoVictoria estate, you agree to allow the use of chat logs (local, group and IM) by the GM/Administrative staff for the purpose of determining game rule violations, making awards and administering the project. Roleplays are regularly posted to the “Roleplay wOOt!” forum of the NeoVictoria community website. if English is not your first language, please wear a translator. Please spell out complete words (not abbreviations), so the translator can do its work properly. Failure to follow this rule will lead to ejection and possible estate ban. NeoVictoria es un SIM de habla inglesa; si el inglés no es su primera lengua, por favor usa traductor. Por favor de letrea las palabras completas (sin abreviaturas) para que el traductor pueda traducir correctamente. De no seguir la regla puede ser expulsado o incluso prohibir su acceso al SIM. We have a free translator in the folder the rule-giver prims send you.